Another StripSearch challenge. 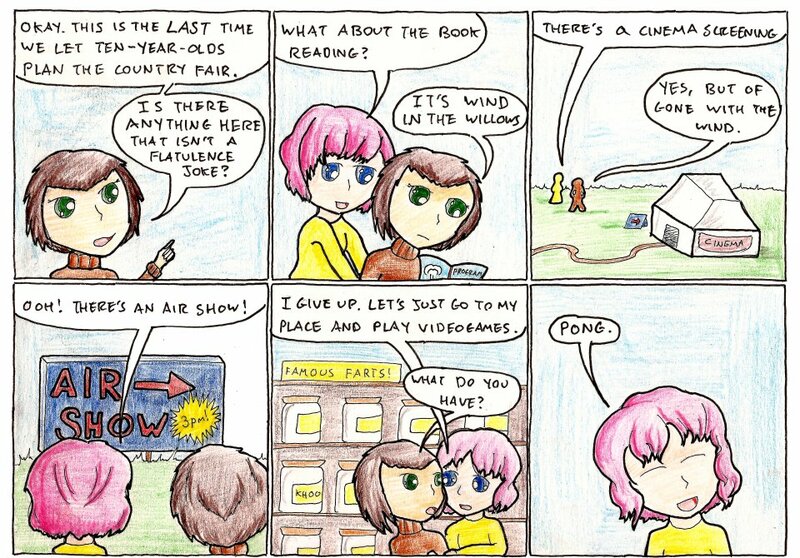 This time to make a comic using the concepts of “flatulence” and “country fair”, in less than 90 minutes. This one was pretty tight on the time, I used pretty much every moment of the 90 minutes, and I was just glad that I came up with a joke quickly – I feel these are a difficult pair of topics to make funny in a short period of time. My first idea was to draw a “best in show” style competition with different passings of wind, getting progressively more ridiculous, with rainbows in the middle, and mushroom clouds at the end, but it just wasn’t particularly funny.